Are you going on holiday to Sicily? You cannot miss these places! Sicily is full of wonderful places. It is an island where you can really find everything from the sea to the mountains, from art cities to places where you can have fun with friends. One of the strong points in Sicily is the weather: in fact, Sicily enjoys a warm weather during the Summer and quite mild during the Winter. Tourists choose Sicily as their holiday destination, especially because of the food and the weather conditions. We have already talked about the 10 specialties you cannot miss in Sicily. Now we will give you advice about what you have absolutely to see. If you plan to visit Palermo, you should also go to Monreale: here, the Cathedral of Santa Maria Nuova is the main attraction for tourists and mosaic lovers. 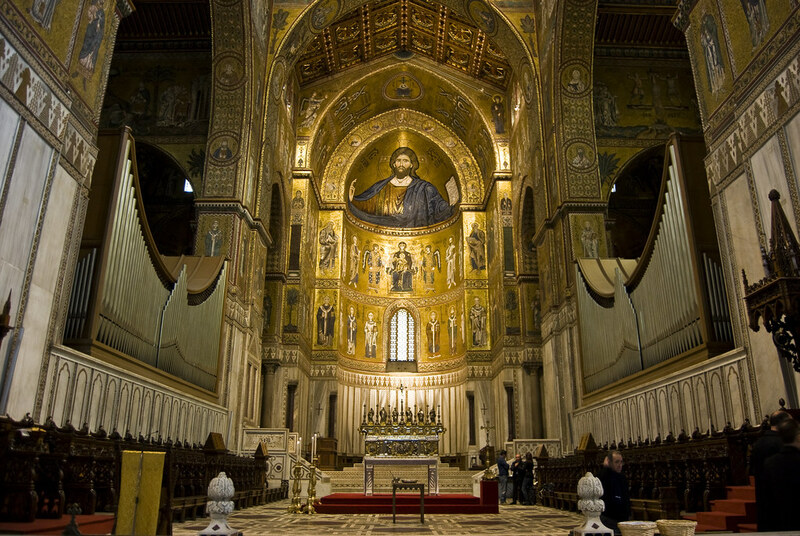 In fact, the main feature of the Cathedral are the beautiful mosaics dating back to the Byzantine era. The Cathedral of Monreale is part of the UNESCO World Heritage Site. 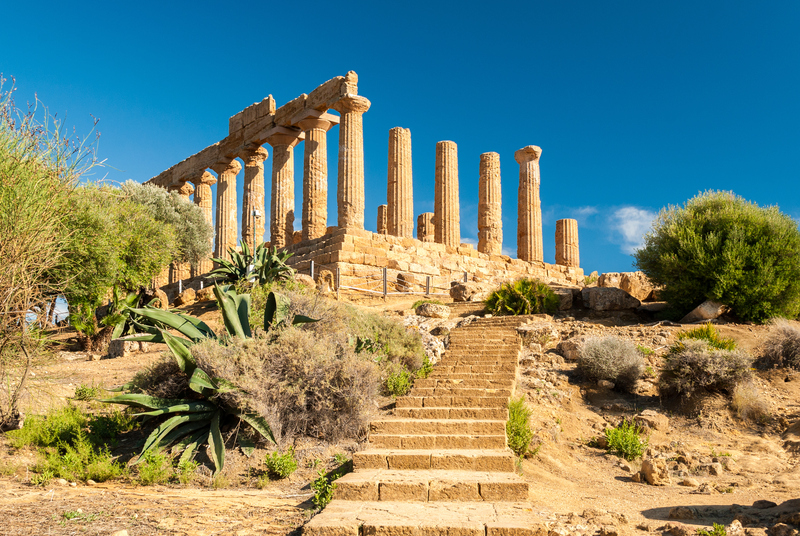 A lot of Sicilian monuments and places are part of UNESCO. The Valle Dei Templi is just another example. The entire area is, in fact, part of the list. There, it seems that time has stopped … the atmosphere is so impressive that you will think to be back to the Greeks Era, surrounded by temples. Etna is the highest active Volcano of all Europe and it is the symbol of Catania. This is one of the favourite destinations for tourists, for both Italians and foreigners. If you love naturalistic excursions, you should do an Etna trekking tour. Have you children? This is not a problem : it is possible to choose also an easy-level trekking, suitable for children. After the excursion you can have a picnic surrounded by nature or you can buy souvenirs around the Rifugio Sapienza. Are you also planning to go to Syracuse? Go and visit also Ortigia, the oldest part of the city. This is a small island dating back to Greek times. Ortigia is famous for its retro style, for the sea, and for the Arethusa Fountain, which inspired a lot the Greek mythology. Panarea belongs to the Aeolian archipelago. Among the Aeolian Islands, it is the smallest and oldest island, but it is also the most chosen one from tourists. Its colours are very typical and look like the ones you find in Greece: in Panarea you will be surrounded by white and blue buildings, as if you were in Mykonos. It’s no coincidence that many VIPs choose Panarea as their holiday destination. The Church of San Benedetto dates back to 1355 and it is located in Via Crociferi, one of the areas recognized as a UNESCO World Heritage Site. The church is part of the Monastero delle Benedettine, where still today live some cloistered nuns. Tourists choose to visit it especially to admire the Scalinata dell’Angelo and the frescoes painted by the Sicilian artist Giovanni Tuccari. Thanks to these magnificent frescoes, the Church is called “Little Sistine Chapel”. Bronte, also known as the city of pistachio, is a small town on the slopes of Etna: it is part both of the Park of Etna and both of the Park of Nebrodi. Bronte is perfect for the ones looking for the typical calm of a small Sicilian village with its pure mountain air. Moreover, don’t miss this opportunity if you are curious to taste the authentic Bronte PDO pistachio. Aci Trezza is a small fishing village in the city of Catania. It inspired the Sicilian writer Giovanni Verga, who set there his novel I Malavoglia. You can choose a sailing boat tour to admire the Riviera dei Ciclopi and the Ulysses Caves, which are geological sites that are visible from the coasts of Aci Trezza. However, you can also have a walk or have lunch in Aci Trezza: there are lots of restaurants where you can enjoy excellent Sicilian fish. The Ancient theatre of Taormina is an ancient Greek theatre. It is the second oldest Sicilian theatre, second only to the Greek one of Syracuse. Today the theatre is not only a tourist destination: it hosts also important cultural events, such as concerts, conferences and the Taormina Film Fest. The theater has also hosted the G7 of Taormina in 2017. In Taormina, moreover, there are other places to visit. It is possible to mention Isola Bella, famous for its magnificent maritime landscapes. The staircase of Santa Maria del Monte dates back to 1606 and its long more than 130 meters: it has been the symbol of the town of Caltagirone, since ancient times. It is made of 142 steps, all decorated with painted ceramics. Each step represents a different topic: some steps are decorated with floral motifs, others represent animals, others have geometric motifs. Would you be able to climb all the steps and get to the top? It’s really worth it! Step by step, you’ll feel the authentic Sicilian folklore: at the sides of the staircase there are, in fact, old houses, small restaurants and souvenir shops. Sicily counts a lot of amazing places: of course there are many more places to visit. If you are organizing your vacations in Sicily, you should visit as many places as possible, rather than staying in only one city. In this case, you could choose our transfer services or our guided excursions that would allow you to visit different places, all in one day. Sicily is one of the most beautiful areas of Italy: the weather, the ancient origins, the people, the art, the excellent food, the nightlife of Catania … these are just some of the reasons why you should visit the Island of the Sun.